This weekend saw the annual Silverstone Classic event take place at the home of British Motorsport. One of the races to take place on what was a beautiful Saturday was the third leg of the Stirling Moss Trophy for pre' 61 sports cars, featuring a plethora of Lister models. As we announced earlier in the year, the Trophy has added spice this year as all Lister Cars that take part have an extra incentive in the shape of the Brian Lister Cup. 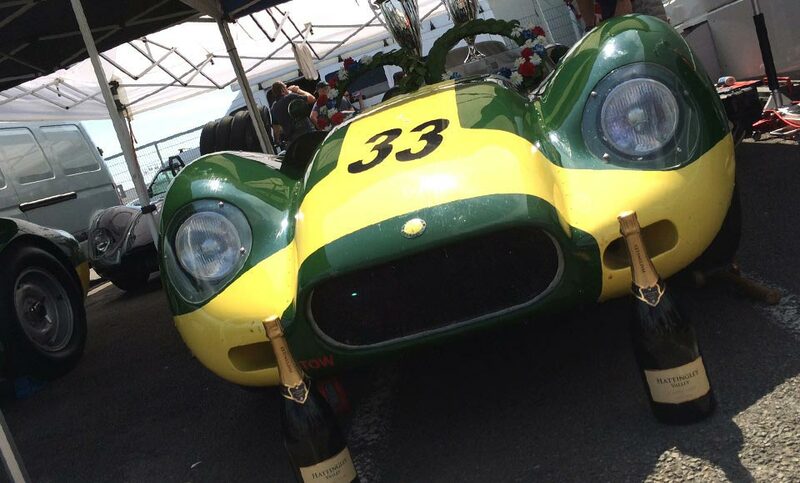 It was a very proud moment indeed as Lister stormed to a one-two finish, with Jon Minshaw & Phil Keen in the Lister Jaguar Knobbly taking the chequered flag, followed closely by the Lister Jaguar Costin of Chris Ward. Minshaw and Keen had qualified with the fastest lap on the Friday so we were very confident going in to the race. Duncan Wiltshire from Motor Racing Legends was a keen spectator of the race and had this to say: "It was a Lister one-two in yesterday's Stirling Moss Trophy and a thrilling race". On a more sombre note, we were very sad to hear about the passing of Denis Welch after he was involved in an accident over the weekend. We at the Lister Motor Company send our deepest condolences to all his family, friends and loved ones. Copyright 2018 The Lister Motor Company. All rights reserved. Lister T&C’s available here.